It’s hard to find a more effective way to stop abortion than the one that is offered through the ministry of Pre-born. It has been demonstrated scientifically that 80% of the time, when a mother sees her baby and hears her baby’s heart beat, she will choose to keep her child. The simple fact is that when we see what’s going on, we know that this is a real person and that abortion doesn’t do any good for anyone. This ministry has provided a way for us to pay for ultrasounds at pregnancy centers. Pre-born’s ministry is set up in such a way that 100% of your gift goes to those services too. They can do this because they have arranged for separate donors to pay their administrative expenses. A gift of $140 will pay for 5 ultrasounds. This includes the use of the ultrasound machine and the presence of professionals to operate the equipment. The statistics are clear, if you give, you will directly save at least 4 babies lives. If you want to take a bigger role in saving babies, Pre-born also has a program by which you or your group may donate an entire ultrasound machine for about $15,000 to one of the clinics that has requested one. The work of Pre-born doesn’t stop with the ultrasound. They are also committed to evangelism. The mothers and fathers who come to these pro-life clinics are going to hear the saving message about Jesus too. 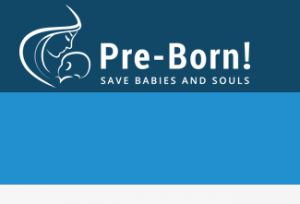 Pre-born offers evangelism counseling to more than 40 clinics across the United States. In 2017 alone, the gospel was shared 20,271 times and 8,409 women received Jesus. It is important to this ministry to not only save babies, but to save the souls of their parents as well.